Finally decided to give these stuffs to Salvation Army, rather than sell them on eBay. Too much trouble for me. "If it is too good to throw it away, give it to Salvation Army." Think they can use them in a better way, rather than collecting dust in my study room. Took a snapshot of them using my P990i. Said bye bye to my Yamaha external Cd writer (bought in 1995), PowerMac G4, Lexmark monochrome laser printer and Epson 1520 A2 size printer (bought in Dec 1999 - antiques now. ), Hp Office Jet 950 (wedding anniversary gift from my wife few years back) and an A3 laminator. My shop lease contract expires 31st March 2008, and 28th March 2008 should be the last day of business day. The management of China Square Food Centre will be revamping the whole building with carpark at basement (crazy for such a small space), banking hall and restaurants for 1st storey, offices for 2nd, 3rd and rooftop. Wondering how they are going to do it.Anyway, I will be working from home after that.This could be a big challenge, as now I don't have exposure to the public like in Clarke Quay (with pushcart), busking in Orchard Road, and a retail shop currently.What gave me the courage to do so is my website and blog exposure on Search Engines like Google and Yahoo. When you search for 'caricature Singapore', they appeared on the first page, and occupy about 3 (sometimes more) out of the 10 links on the first page. It was a totally different case about 3 years back. You can hardly find them on the search engines. Most of my clients found me online now. They place their order via email and phone, and collect the finished artworks from my shop. There are some walk-in too. Giving up a retail shopfront, meaning that I will lose a fair bit of the latter. Think my competitors are the happiest bunch, when I work from home. My wife should be glad too. Can ask me to run errands for her, so that she doesn't have to take leave to do such things. Last, should be me. Save on the rental, petrol, season parking, expensive business broadband plan of $172 monthly, electricity and phone bills, ERP etc. Let me try it out first. If it doesn't work out, or one day when I would like to get a shop again, I will be back. Two and a half years back, when I setup this shop in a food centre, my competitor and some customers think that there must be something wrong with my decision, especially this place only crowded between 12pm - 2pm. But it works! Anyway, my backlog orders are pretty huge recently. My clients are puzzled why they would need to wait for about 3-4 weeks to get their drawings delivered. Even when they are willing to pay more for express service, I can't accept their orders due to my workload at that time. I hate giving empty promise. Rather give up that deal, then not able to deliver when collection date is due. Back to my SOHO (Small Office and Home Office). Was planning the space and layout when I move all those stuff from my shop back. Since I bought them from IKEA, I went to their website to get the dimensions. 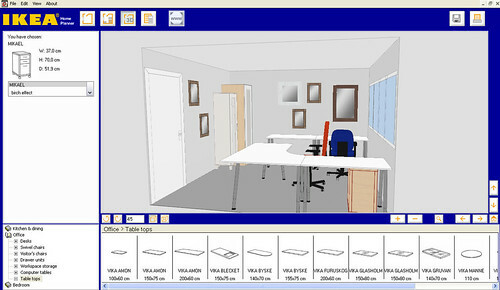 And surprisingly, they have their own 3D software for their customers to do simple planning. 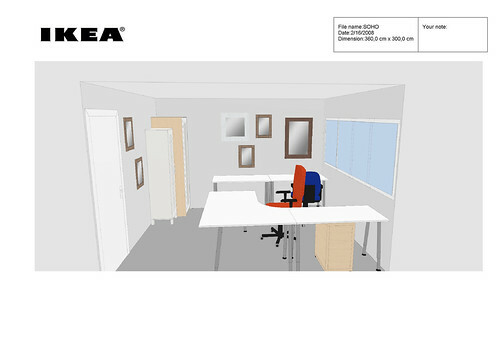 Too lazy to fire up my 3DS Max to do the visual (which may take me few hours or longer), I decided to use the IKEA software. Considering a software of less than 20mb when compressed, it is quite acceptable, though with some limitations here and there. This is my initial plan of the SOHO layout. Colour scheme may follow the current shop one. 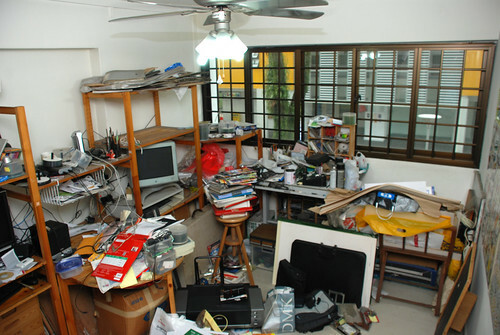 It will be a super big challenge, as first I have to clear up the mess in my study room. It has turn into a big store room for my comics, cd, IT gadgets, drawings etc since the day I move in 5 years+ back. It became worse when I have my shop, as I seldom work in this room. It was well-known to my friends and relatives who have been to my house. Quite a shame, but still put up a photo here, as this is going to be history. My wife has thrown away the sofa set few months ago. 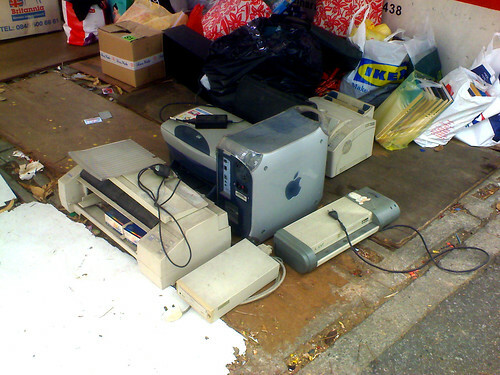 I have donated my PowerMac and printers etc. Still very messy. Tak boleh tahan. 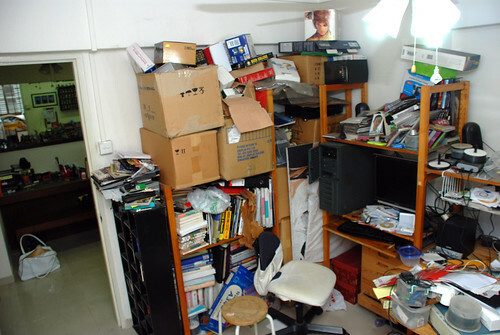 Clearing up this mess will be my biggest project in the coming weeks.